The wet season is a bane for all cyclists. In the Philippines, the rainy season lasts for about 5 months (June-October) and typhoons can get really strong. Another problem is the prominence floods in the metro. Since 2013, ive tried all sorts of rain gear, ponchos, jackets etc. But I couldn’t find a solution to wet feet. Getting your feet wet isn’t just uncomfortable (I just hate the feel of soggy socks) but wading in flood water increases the risk of waterborne diseases. I’ve learned about waterproof socks early this year and was able to get some and test them over the course of a month. From lights showers to torrential rains, here’s my take on 4 brands-Antu, Dex Shell, Seal Skinz and Showers Pass. Waterproofing-how long can the insides of the sock stay dry? Breathability-Can it wick sweat and stay cool while pedaling? Price and Availability- Which is best for my budget and are they available locally? Ive done a range of rides over the month using each in varying conditions (light showers and heavy rain) between 2-5 hours. Using cycling sandals to allow exposure as well as easy draining of water, these socks were exposed to varying weather to simulate conditions on a tour or longer ride. It performed well in the soak and field test as no water came in but it did feel damp suggesting that extended exposure may cause a leak. The verdict: Among the ones tested, this is the best bang for your buck sock if you intend to go bike commuting or urban rides rides and can serve as a back-up while on tour. I got these when I was about to get home from a meeting and realized that rain was about pour down. Getting my bike from the shop, I pedaled for an hour under heavy rain and encountered flooded parts down south. The Dex shell socks also has three layers that claim to repel water and wick sweat. While it did the job for my commute home, it was never the same after washing it. Apparently ,it lost its waterproofing quality and the soak test verifies this. As some reviews claim, this is the problem with the socks. While I was advised to hand wash them, the packaging and website suggest that these socks are machine washable which I did. But I suppose regardless of the method of washing, quality should be better. For the soak test, this remained dry but during two test rides, I was a bit mixed about them. For the first ride which was five hours, we encountered heavy rain and flooding at the middle of our journey and it ended up trapping water inside my feet. I suspect that the absence of rain pants was the culprit and the extended period of use saturated the socks’ limit in taking in water. For the second ride which was shorter (about an hour), it held pretty much well despite the heavy rain and flooding. This time I was wearing rain pants preventing entry points for water. The verdict: This may be a good choice if you’re commuting to work but you might need to search elsewhere if you want something on tour. Verdict: If you could source this, this is would be an ideal choice. To conclude, while waterproof socks can help you get through your bike ride, I’ve learned that using a combination of other clothing (rain pants, overshoes) increases your chances of staying dry amidst extended periods of rain. I first visited Decathlon earlier this year when i was in Singapore. A friend told me that this superstore had a range of sports gear for different activities at friendly prices. Since ive been on the look out for small parts for touring, i wasnt disappointed with Decathlon’s inventory (got my bikestand and cage mounts here!). This month, Decathlon opened its first branch in the Philippines and didnt disappoint. Occupying a large area on the second floor of Festival Mall, Alabang, a couple of friends and i visited the branch. True enough much like their Singapore counterparts, Decathlon Philippines had a wide variety of sports items (even horseback riding!) at friendly prices. For the bike tourer/cycling enthusiast, the house brand called BTWIN has decently priced bikes with satisfactory specs (i predict these can even rival the budget friendly Trinx brand that’s popular in the Philippines). What appealed to me is the large inventory of small items for the bike tourer-bags, accessories such as bike stands, pump, and even cages as well as racks. In addition, the camping gear section also has budget friendly items -sleeping bags, tents and hammocks which may be expensive in some stores. What i found also appealing is that the staff were really courteous and spent time talking to us about our gear and cycling trips. hopefully, in the years to come, the staff will maintain this to attract more customers. While i cant say that the cycling/touring gear will be topnotch as opposed to established brands (dont look for ortliebs, revelate designs or a Surly here), Decathlon addresses the needs of those wanting to try bike touring or even bike to work at very minimal cost…so go check it out! the hundred peso bike pump! The next morning, we proceeded to Calbayog (approximately 50km away from Allen Port). The road was bumpy and it was particularly hot during the day making the climbs a bit difficult yet the view which gives a glimpse of the seaside makes the ordeal less miserable. We decided to stay at the Coral reef beach resort…though it had a view of the beach we didn’t have access to the shore! Facilities were fairly ok but we managed to get through the night with a wonderful open cottage (1500 for a night and can fit as many as you can) (https://www.facebook.com/TCRBeachResort/). Traveling approximately 90kms, the trip to Catbalogan, Samar was even more challenging as we encountered several rolling hills and heat seemed to intensify as the day progressed…good thing though there were several stores along the way where we could rest and take advantage of the shade…Upon the recommendation of Cyrk, we proceeded to the fame hotel located in the heart of the city (https://www.facebook.com/pages/Fame-Hotel/130987193726452). The facility had the basics, but it took an effort for us to bring our bikes to the second floor as the stairs were narrow and steep. Our fortunes changed when weather turned out a bit better as we encountered fair skies…though the terrain had still the occasional climbs, it was fairly manageable…for this day we were greeted with late afternoon rain (and it was freaking cold! )…we hoped to get to Tacloban but it was getting late and after I sustained a flat tire on my rear, we decided to call it a day at Calbiga, Samar…luckily the town is quite big and had many homestays (at least Php 200 per person per day) and people are eager to point you to the right direction. the homestay at Calbiga-seems to be a home refurbished for lodging-air conditioned rooms are spacious and clean! I remember Mark (who does fieldwork in Mindanao and Visayas) reminding the group that as we approach Leyte, weather is far different compared to the Metro-and he was right-I recall waking up early and it was raining and it was unclear whether we’d be able to get to Tacloban on that day. Though we only needed to bike 60-65 kms to Tacloban, I was concerned about not reaching the Iconic San Juanico Bridge before sunset…True enough, we got to Tacloban at around 7 or 8pm and we weren’t able to get good photos of the longest bridge in the country…good thing the group decided to stay a bit longer as we wanted to go around town. The next day, aside from running errands we had our chance to see this beautiful bridge (it is said that the San Juanico Bridge is about 2.16kms long) that connects and Samar and Leyte. I recall this was a long and physically challenging day as we needed to get to Mahaplag (approximately 90km away from Tacloban) and though the majority of the road was flat, things changed when we got to Abuyog, Leyte where unrelentless climbs were encountered…though weather was cool and breezy, very little lighting was present and made the trip more challenging. We ended this day at the Mahaplag inland resort, (https://www.facebook.com/MahaplagInlandResort/?hc_ref=SEARCH&fref=nf) a nice government run facility which charged a decent price (Php 1000 for four people) but was a fine accommodation. Though we only needed to pedal about 60kms, we took time in taking photos at the 1000km mark as well as the famous Agas-Agas bridge which is the highest in the country, I remember that aside from several kilometers of climbs, rain was light to heavy prompting us to stop several times to take shelter…The roads are wide and very few vehicles would pass by making our trip to the port of Bato manageable…good thing there was a police station at the town of Bato and led us to a lodging house beside the port (800 Php for four persons) and from there we rested for the next day’s boat trip to another part of the Philippines. Interestingly, the Samar-Leyte leg gives you a hint that foreigners often biketour the area as we were often shouted at with expressions such as “Hey Joe”. Upon interviewing, some locals in different areas, this seems to validate the observation as indeed many European and American biketourers have frequented the area (which seems to be the case in other parts of the country as well). Roads are tolerable but certain sections are ridden with potholes (specifically ,the stretch from Allen to Calbayog due to many trucks travelling along the area as well as in Tacloban due to frequent road constructions). Be prepared as well to ride with EXTRA caution as traffic is a bit chaotic in the areas of Catbalogan and Tacloban. If you intend to biketour these regions, February is the perfect time as typhoon season is relatively over and summer heat isn’t as excruciating compared to the ones experienced in April and May (I am grateful to Glenda, my graduate student for reminding me to reschedule the loop from November to February as typhoon season is at its peak in the area during the closing months of the year). The path from Samar to Leyte is a scenic one. That is, you’ve got a combination of seaside views while riding and mountainous areas as you get deep into the heart of Leyte. This is where we first encountered a change in itinerary as we were supposed to head to Maasin City, Leyte for the Mindanao leg but we had to change our route due to reported skirmishes between rebel and government forces in Mindanao. Good thing, Cyrk and Natalie recommended that since we were heading to the port of Bato, we would also pass by Agas Agas bridge which was a nice landmark in this leg. You might think that our tour was an extensive one. I’d say our tour was a rough survey of the country-being an archipelago with several islands, biketouring the Philippines may take more than 37 days. Therefore, if you’re interested in getting information aside from the stuff I’ll share, you may refer to these pages as well https://www.facebook.com/nelography/ by Nelo Varias and http://bikepackingphilippines.blogspot.com/ by Arthur Reblando and Jaime Perez as these were helpful when we planned our own tour. All of us had varying experiences in long distance cycling-nothing really serious such as joining professional races and all, but we were familiar about the physical, mental and financial demands of the activity. We weren’t really focused on just merely cycling the route but also devoted time to being a tourist in our country, pedaling our way leisurely with the intent of getting a sense of place and experience what each locale had to offer-food, other activities etc. In terms of budget, we pegged the estimated expenses at Php 1,000 a day (roughly 20 USD) for food and accommodation. The accommodation were mostly inns and lodges, hotels or resorts (there are many cheap ones with varying levels of quality in service and amentifies). Prices vary from 200-500 per person. Interestingly, the expenses for food and lodging become lower as you go deeper into the provinces (except the ones that are popular among tourists). One popular option that cyclists take would be to camp or stay in government facilities such Barangay (town) halls, Police stations or even basketball courts or waiting sheds which significantly lower expenses. Striking a healthy balance between safety and adventure were common concerns. This was evident when we had to change our itinerary midway and had to drop a significant portion of our trip in Mindanao where several skirmishes between rebel government forces were reported and we were advised by friends to consider rerouting our trip. Moreover, road conditions and dealing with annoying motorists in narrow roads was experience throughout the journey. Timing is crucial. We scheduled this tour in late february to make sure that the areas for touring would be generally dry and manageable. For day 1, we all converged at KM 0 in Manila to formally start the trip and pedaled to Quezon via Luisiana (to avoid heavy traffic) and ended up in Tayabas Quezon (roughly 130km). Luckily, we were accompanied by several riders who did a send off for the group. Day 3 was tough as we entered Camarines Sur and rode through the tough Quirino Highway going to Bicol. Though it was generally hot the whole day, we ended up at Del Gallego, Camarinus Sur (estimated at 80km). We spent time at the Cagsawa Ruins in Albay where the old church tower and the full view of the volcano was in sight. After a couple of hours we headed to Sorsogon where a couple of friends were eagerly waiting for us to arrive. 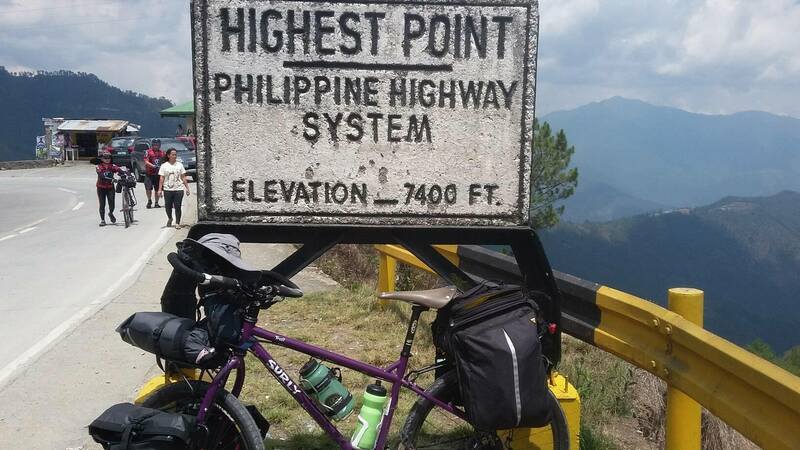 I recall the trip from Bicol to Sorsogon (estimated 105km) was a challenge as rolling terrain and certain sections of climbs were encountered coupled with dry spells of heat. Good thing our good Samaritans from Irosin, Sorsogon met us to bring us to a nice hot spring resort in the area. For last day in Luzon for our loop, our good Samaritans Cyrk and Natalie of Irosin Sorsogon brought us to Bulusan lake-a popular site in the area. We were given a walking tour by the park staff and had lunch and coffee with our friends. Late afternoon we proceeded to the port of Matnog to take the Boat going to Eastern Visayas (estimated 25km).